1998: Brooke's Bedroom made it's debut on B&B. 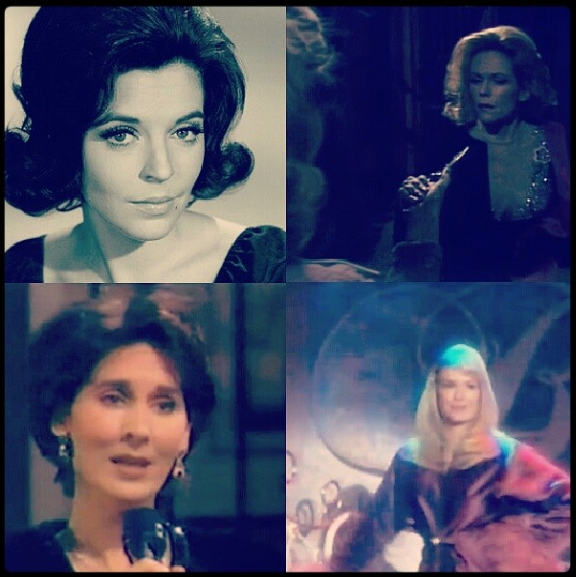 1968: Susan Seaforth (Hayes) debuted as Julie Olson in Days of our Lives. She has been nominated for four Daytime Emmy Awards for her work on the soap. Check out our 2010 in-depth interview with Mrs. Hayes and her husband and Days co-star, Bill Hayes. 1974: On Another World, Iris Carrington (Beverlee McKinsey) informed Louise Goddard (Anne Meacham) that Liz Matthews was moving in with them. 1979: On As the World Turns, Lisa Colman (Eileen Fulton) had one final showdown with Hester Pierce (Ann Stanchfield) as her story at The Willows concluded. 1979: On Another World, Eileen Simpson Perrini (Vicky Dawson) died. 1980: On The Edge of Night, Logan Swift (Joe Lambie) informed Raven (Sharon Gabet) that he was leaving town with their son, Jamey. 1984: Actor Richard McMurray died at age 68. He played Dr. Mel Bailey in Days of our Lives in the late 1960s and 1970s. 1985: On Guiding Light, Reva Shayne Lewis (Kim Zimmer) told Miss Sally Gleason (Patricia Barry) she would not let her stop her wedding to Kyle Sampson (Larkin Malloy), threatening to reveal to Kyle that he was the son of H.B. Lewis. 1986: Actor Paul Keenan (Todd Chandler, Days of our Lives; Tony Driscoll, Dynasty) died at age 31 due to complications from the AIDS virus. Check out our recent World AIDS Day tributes here, which also includes actor Tom Fuccello, who was born 79 years ago today. 1991: On The Young and the Restless, Paul Williams (Doug Davidson) was upset when he woke up in bed with Lauren Fenmore (Tracey E. Bregman). 1995: On Another World, Donna Love (Anna Stuart) sang "Someone Like You" to Matthew Cory (Matt Crane). 1995: On All My Children, Julia Santos (Sydney Penny) was chloroformed by Louie Greco (John Millard), who then carried her out of Noah's apartment. 1995: On One Life to Live, Blair Cramer (Kassie DePaiva) told Viki Buchanan (Erika Slezak) that she was pregnant, and Todd Manning wasn't the father. Meanwhile, Patrick Thornhart (Thorsten Kaye) tried to convince Marty Saybrooke (Susan Haskell) they could still work things out in spite of the baby. 1998: On The Bold and the Beautiful, Forrester Creations held a press conference to launch the company's new Brooke's Bedroom division. But Brooke Logan (Katherine Kelly Lang) had her own ideas on how to launch the line bearing her name, so she crashed her own party! 2000: Actor David Lewis died at age 84. He was nominated for five Daytime Emmy Awards during his run on General Hospital as Edward Quartermaine, winning in 1982. 2003: Heather Tom debuted as Kelly Cramer in One Life to Live. 2006: On All My Children, Josh Madden called Zach Slater to tell him he found Erin Lavery's (Connie Fletcher) lifeless body, making her the second victim of the Satin Slayer. 2009: All My Children taped for the final time in New York City. 2009: On General Hospital, Rebecca Shaw (Natalia Livingston) told Nikolas Cassadine (Tyler Christopher) she would keep quiet about her accident as long as got what she wanted: Lucky Spencer.